Identification: Page and Burr (1991); Etnier and Starnes (1993); Jenkins and Burkhead (1994); another commonly used name is Notropis ardens. Snelson (1990) recognized two subspecies, L. a. ardens and L. a. fasciolaris. Dimmick et al. (1996) recognized L. ardens as a species complex; as part of a re-evaluation, they elevated L. a. fasciolaris to species status, and resurrected L. matutinus from synonymy. Mayden et al. (1992) and Gilbert (1998) treated all three species as valid. Native Range: Atlantic Slope from York River drainage (where probably introduced), Virginia, to the Cape Fear drainage, North Carolina, and in several drainages of the Ohio basin in Virginia and West Virginia (Snelson 1990; Jenkins and Burkhead 1994). Table 1. States with nonindigenous occurrences, the earliest and latest observations in each state, and the tally and names of HUCs with observations†. Names and dates are hyperlinked to their relevant specimen records. The list of references for all nonindigenous occurrences of Lythrurus ardens are found here. Means of Introduction: Unknown; probable bait bucket release. 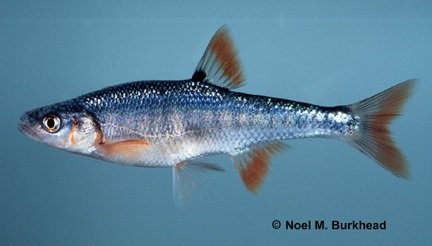 In Virginia, it was first discovered in the South Anna system (Deep Creek) of the York River drainage in 1968, and probably later spread into the North Anna system where it was first discovered in 1979; the species is presumed to have come from an adjacent portion of the James River drainage (Snelson 1990; Jenkins and Burkhead 1994). Remarks: In their taxonomic revision, Dimmick et al. (1996) recognized three distinct species in the L. ardens complex and they restricted the range of each of the species. Based on the distribution map given by Dimmick et al. (1996) for the three species, we can assume that records from the Muskingum River drainage, Ohio, represent Lythrurus fasciolaris, those from the York drainage, Virginia, are the true L. ardens, and those found in the Cape Fear drainage likely represent L. matutinus. However, among the L. ardens complex, Dimmick et al. (1996) apparently only recognized populations found in the York River drainage of Virginia as introduced. Snelson (1990) provided details on the distribution of native and introduced populations. Stauffer et al. (1978) and Hocutt et al. (1986) listed this species as probably introduced into the Potomac drainage. However, Stauffer et al. (1978) indicated that it could feasibly be native to that drainage.